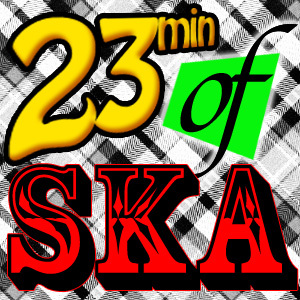 23min of Ska : Do You Know What is Cool? Friends, well actually listeners, but I do consider all my listeners friends, it has been an odd 24 hours. One moment I’m with my wife at the Veronica Mars premier high fiving Ryan Hanson, the next I’m home dealing with a hot water heater springing leak and sending hot water flying everywhere. Ups and downs, that’s how life goes. But something is always there to get us though, music, love, stuff like that. We celebrate those things in our good times, hold on to them tight in the bad times, and in the times in between we get joy when what makes life worth living pops up. Speaking of joy occasionally popping up, for me Coolie Ranx is always a welcome addition to any song ever recorded. See, “Dub 56” was my very first ska album so the awesomeness of ska music and Coolie are forever linked in my head. This episode celebrates bands Mr. Ranx has been a part of and songs that he’s guested on, believe me, it’s all great stuff, I hope you enjoy it.